This isn’t Kill Bill, it’s The Walking Dead. The Walking Dead is back but, unfortunately, your regular recapper is not. Rob Bricken wasn’t able to recap this week so I’m filling in as the io9 staff member who quit The Walking Dead most recently. That being, about two seasons ago. So my apologies up front if I miss some nuance or characters that have been introduced since the war between the heroes and Saviors was raging because, frankly, that’s when I gave up. My first thought? Color me impressed. 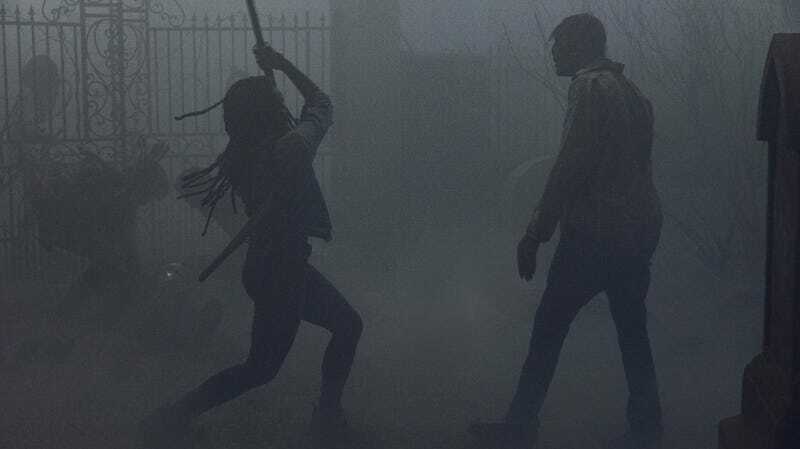 After giving up on The Walking Dead two seasons ago, to come back and find the beginnings of a new villain and some major characters at even bigger crossroads was a hell of a warm welcome. The show sets up that Negan is seeing things. Like the river he drinks out of that’s actually sand. So, we assume when he’s riding his hidden motorcycle back to Alexandria to give himself up, the fact that he sees young Judith with Rick’s gun, hat, and Michonne’s sword is a vision. I mean, it better be. Otherwise, how the hell did she get out on her own? She’s a child. Either way, Negan talks to Judith/his vision of her and agrees with what she said earlier in the episode, “There’s nothing out there for you.” Negan says his cozy cell is better than the outside world and he’s ready to go back. Is he’s being honest? Again, we’ll have to wait and see.